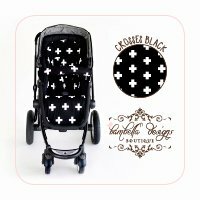 Bambella Designs universal stroller liners are handmade to the highest standard using 300 gram density inlay for additional comfort. Our liners are designed to fit most strollers on the market with a five point safety harness and come with side wings to offer added support for your baby and extra protection for your stroller. Each liner is made from 100% cotton and has an absorbent layer of PUL sewn into the liner to add extra protection from spills or for when toilet training. Our liners are also reversible with a complimentary plain coloured fabric to match. Our liners are designed to fit most strollers on the market with a five point safety harness and come with side wings to offer added support for your baby and extra protection for your stroller. Our liners are also reversible with a complimentary plain coloured fabric to match.